I was not raised Catholic (though Tom and I met as members of the Newman Singers, a traveling contemporary choir based out of the University of Iowa's Catholic Student Newman Center, and later married in the Catholic Church as well), but throughout the last two years I have begun to pay closer attention to the Pope. I don't necessarily agree with everything Pope Francis says, but I believe in what he stands for and emulates: inclusion, acceptance, simplicity, humility, compassion, mercy, forgiveness, and love. 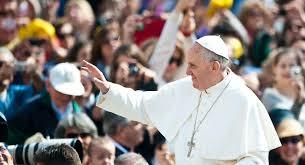 Like many others, last week I watched coverage of Pope Francis' visit to the United States. I jotted down notes on his messages as well as a few favorite quotes, and though I don't believe he said it last week, this quote made its way into one feed or another and prompted me to pause and then delve a little deeper. "Have the courage to be truly happy." After spending a more than a year on the #100HappyDays challenge (which turned into 365+ happy days), I appreciate any words of wisdom that encourage me slow down and appreciate the moment, the environment, and my place within them. And when those words of wisdom come from the Pope? Well, that just makes them even more powerful. Back in a July interview with the Argentine weekly "Viva", Pope Francis revealed his 10 secrets for happiness. “It’s not enough to give them food. Dignity is given to you when you can bring food home” from one’s own labor. 10. Work for peace. “We are living in a time of many wars, and the call for peace must be shouted. Peace sometimes gives the impression of being quiet, but it is never quiet, peace is always proactive” and dynamic. I post the Pope's secrets to happiness not in support of one religion over another or lack thereof, but because so many of them spoke to me on a human level. In the future, when I need a reminder of how I can make my life even happier, I'll return to here, to this post and Pope Francis' secrets. The full text from Pope Francis' interview can be found on both www.uCatholic.com and www.thehigherlearning.com but have edited them down slightly for length.